Juvenile pilocytic astrocytomas (Grade 1 astrocytoma) occur more commonly in children and young adults. 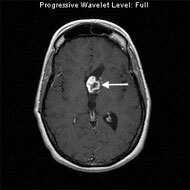 They also have a more favorable prognosis compared with all other astrocytoma types. The most common site of juvenile pilocytic astrocytomas is the cerebellum. The most common symptoms are headache, nausea, vomiting, poor balance and visual complaints, depending on the tumor site. Many symptoms may be due to hydrocephalus. An actual tissue biopsy is typically required for definitive diagnosis in nearly all cases. If the tumor is inaccessible to open surgery, precisely guided (stereotactic) needle biopsies can be performed. Your UCLA neurosurgeon will determine with you how much of the tumor can or should be removed. If the tumor is surgically accessible, a "complete" removal is attempted. This can be curative. If the tumor is surgically inaccessible, a conservative, non-operative approach is recommended. For surgical planning, mapping of critical speech and motor brain regions that may be adjacent to the tumor may be necessary. Such mapping is performed at the world-renowned UCLA Brain Mapping Center. Often, juvenile pilocytic astrocytomas are best removed with the aid of intra-operative MRI, allowing the most complete, safest surgery possible. This MRI image shows a juvenile pilocytic astrocytoma in the ventricle of the left frontal lobe (arrow). This patient had a partial removal of the tumor because the tumor involved the optic nerves.